Record-breaking droughts, fires, and hurricanes have made the near-term effects of climate change a front-and-center issue across America. 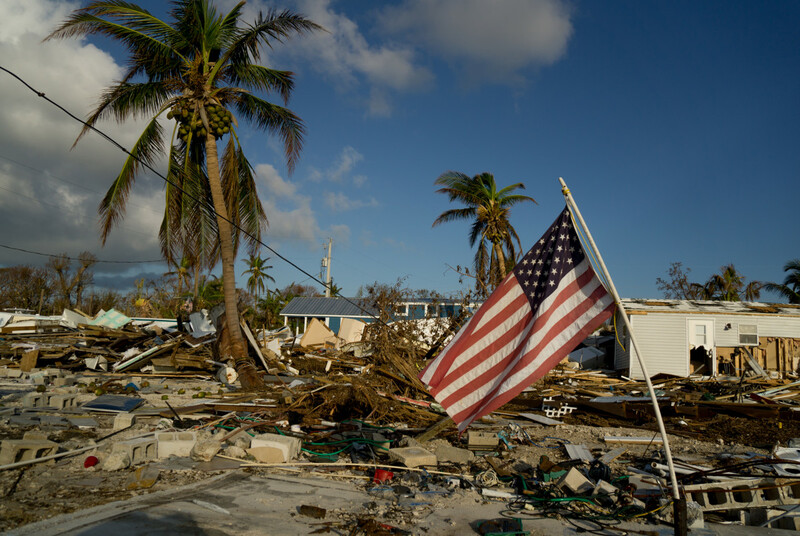 An American flag flies amid the destruction in the Sea Breeze trailer park in Marathon, Florida, on September 16th, 2017. What is happening across the United States is not normal. 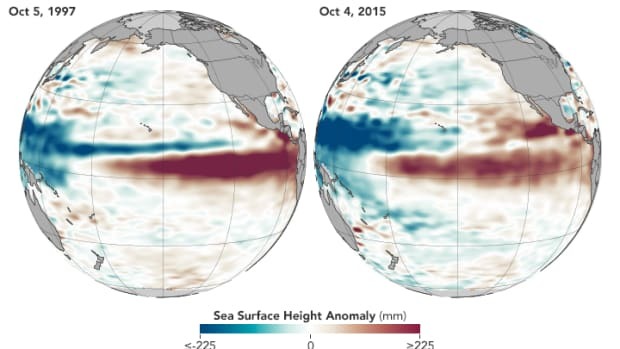 From coast to coast, this year&apos;s weather has been unlike almost anything in history, and, as the year winds down, the data is starting to prove it. 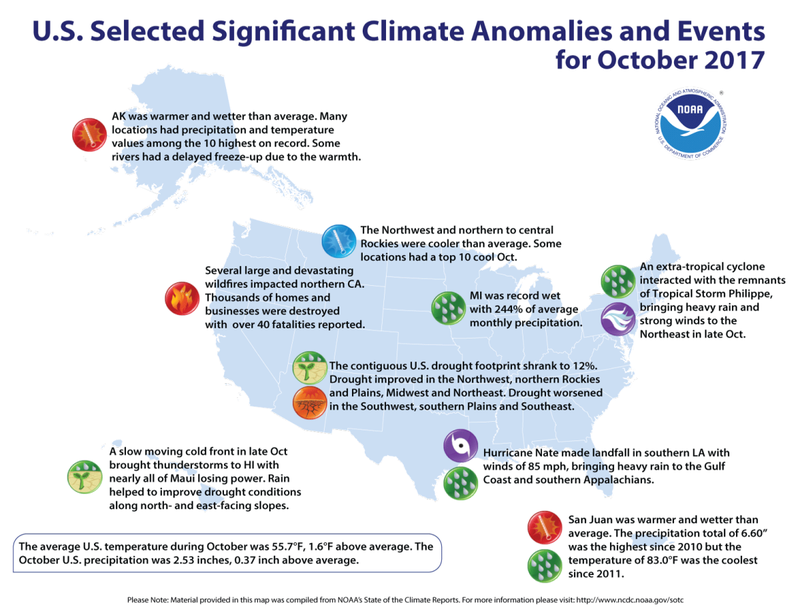 On Wednesday, the National Oceanic and Atmospheric Administration released an update on how U.S. weather is faring this year. The assessment: With record-setting wildfires, drought, floods, and storms, extreme weather this year has been relentless. Out of 122 years of record-keeping, the first 10 months of 2017 rank as the third warmest such period in the U.S., behind 2012 and 2016. That’s right: The three warmest years ever measured in this country have happened in the past five years. Dozens of cities are on pace for their warmest year on record, from Tucson, Arizona, to Miami. Only a single city with long-term weather records—Pendleton, Oregon—is on pace for even slightly cooler-than-average temperatures. Every state in the continental U.S. has been unusually warm in 2017. 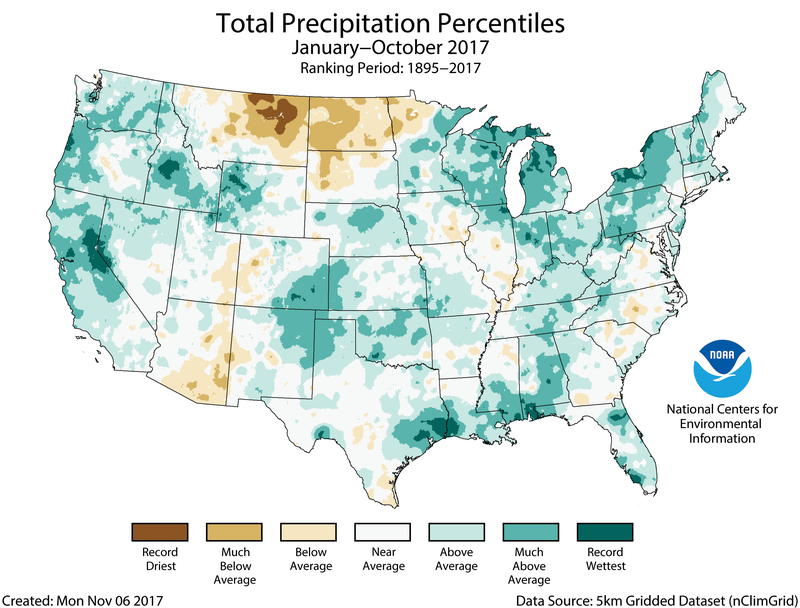 But warm temperatures aren&apos;t the only extreme this year: Several cities across the country—in California, Texas, Florida, New York, and 14 other states—are on pace for their wettest year in history, while parts of North Dakota and Montana will likely have their driest, with less than half as much rainfall as normal. Nationwide, the U.S. Climate Extremes Index—which combines indicators of drought, heavy rain, extreme temperatures, and hurricane impacts, and is maintained by NOAA—places this year as the second most extreme on record, next to 2012. The toll on people and property from coast to coast has been enormous. Puerto Rico remains in a humanitarian emergency, with millions of people without power and hundreds of thousands without a reliable source of clean water nearly two months after Hurricane Maria made landfall. 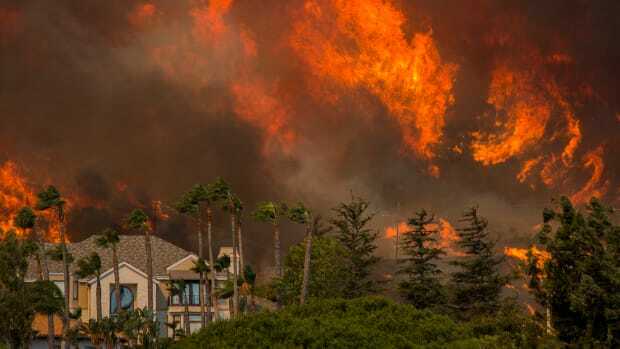 In California, the worst wildfire season in history burned thousands of homes and prompted a re-think of climate policy. Initial estimates for just Hurricanes Harvey, Irma, and Maria—three of the worst hurricanes to ever strike U.S. soil—put the three storms&apos; total economic toll as high as $400 billion, nearly doubling the bill from 2005, which included Hurricane Katrina. 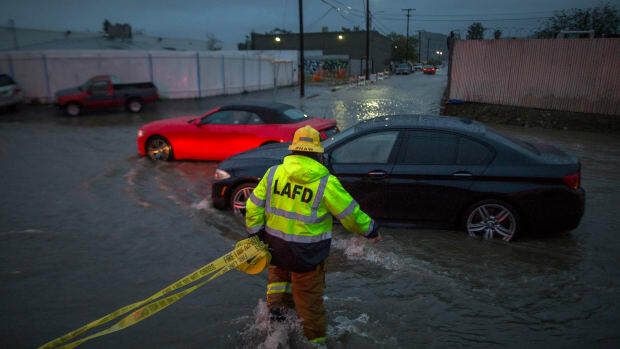 The combined total of physical damage and economic losses from this year&apos;s extreme weather could come in at nearly half a trillion dollars. Officials are still crunching the numbers, but it seems certain that 2017 will be the costliest year for natural disasters in U.S. history. Hard numbers like these reinforce the sense that 2017&apos;s wild weather is a glimpse of what climate change has in store. According to the new National Climate Assessment, the pan-governmental report released last week with the blessing of the Trump White House, the heat waves, droughts, fires, downpours, and exceptionally strong hurricanes seen so far in 2017 are all consistent with what scientists expect will occur more often in the coming years, as the planet warms thanks to rising levels of human-produced greenhouse gases. 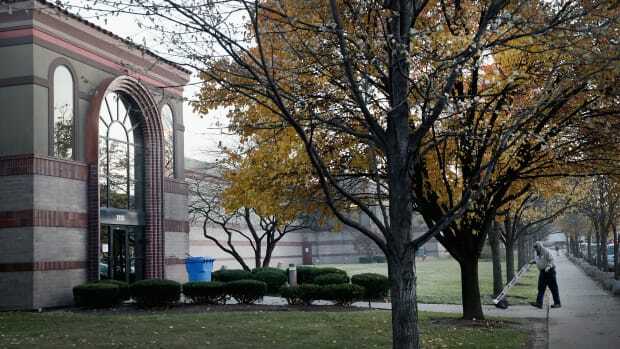 There&apos;s a simple conclusion here, and it&apos;s one that&apos;s becoming increasingly costly to have to keep repeating: Without urgent attention and transformative climate action at the local, state, national, and international levels, America&apos;s climate problem will begin to exact an ever-greater toll on our economy and our selves. 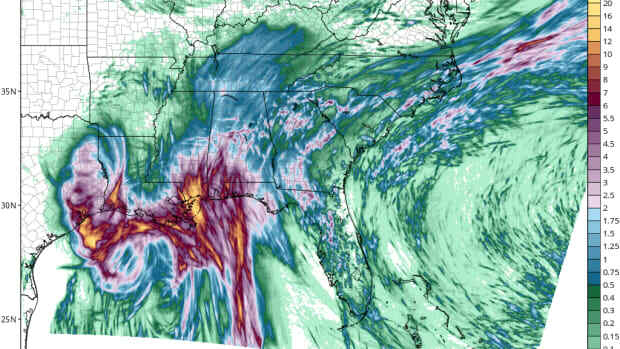 The Gulf Coast is preparing for the sort of rainstorm that is supposed to come only once in a lifetime.